Me: "GUESS WHAT I FOUND!?!?!?!" 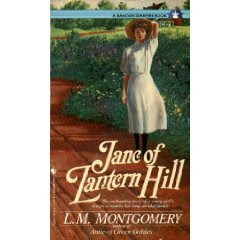 Me: "JANE OF LANTERN HILL!!!" Me: "It's the ONLY LMM work of fiction that I didn't have!!!!" J: "It's a happy day!?" Me: "It's a HAPPY DAY!" Now, in order to really get the full effect you must blast the speakers out on your respective computer speakers and sing along with it at the top of your lungs, ignoring the curious stares of your children (or, perhaps the people in the car stopped next to you at the red light). Some songs are just meant to be yelled. This is one of them. And I'm not going to give you the lyrics in this post because the artist himself is so much more effective in sharing his message (in my humblest of opinions). So, not only did God treat me and bless me with a book I have been looking to replace for no less than TEN YEARS but He also reminded me that He's got me covered. Though I may personally fail a few things, He can still work with me. In my weaknesses His strength is displayed. At least that's the hope I desperately cling to and believe in. Have you been blessed today or reminded of how much God really does care about you!? Do share. Let's dance on the mountain top together. Sometimes dancing on a mountaintop in the company of friends beats out a book review. Just sometimes. Thanks so much for sharing this, Carrie. And to think that I thought I was the only one with "Jonah days." ; ) Today has been one for me. Lulu and Louise have taken turns being sick for the past four days or so, so I've pretty much been housebound. Not really, but it seems like it; we've canceled two of our standing weekly appointments so as not to infect the other children. ; ) Anyway, today was one of those days for me, too. Thanks for your honesty! Congrats on the great find! I know how much you love LMM, and I'm so happy for you :)!! I'm in the middle of reading my Ravi Zacharias book, (when I do post it will be lengthy) and one of the first things he touches on is that Jesus is the only one who has claimed to be "the way the truth and the life" not just A way, THE way, and He gives us the promise that He has overcome the World, He also assures us that because He lives, we live also. Those of us that belong to Him have so much to rejoice in, we are loved by the GOD that created the entire universe, He loved us enough to take our place as a sacrifice, to rise again as LORD of all! Yep, I'll dance on that mountain top with you! Because I have been blessed, OH YES!